Scottish artist bn 1858 Dundee, Douglas claimed to be a self taught artist, with his first exhibition, at the age of 16, in Dundee. 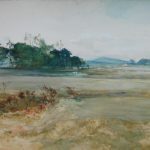 He exhibited three watercolours of at the inaugural Dundee Fine Arts Exhibition of 1877, and a watercolour, an oil, and a pen & ink at the Dundee Fine Art Exhibition of 1879. Over 100 of Douglas’s paintings were produced as postcards by the publishers William Ritchie & Sons and Cynicus Publishing Co, Tayport Fife. He was elected member of the Royal Scottish Society of Painters in Watercolours (RSW) in 1900. Works by Douglas were exhibited in the Royal Academy, Royal Scottish Academy, Royal Institute and the Dundee Fine Art Exhibition.